Suit up, Scott! 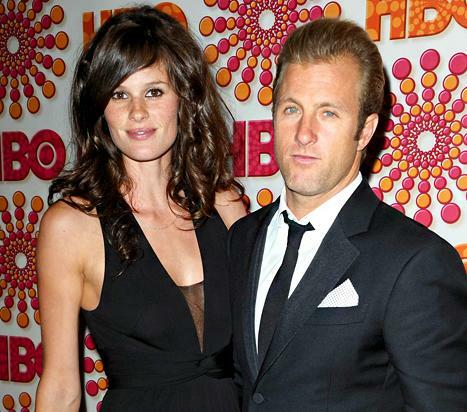 Hawaii Five-0 actor Scott Caan and his girlfriend, Kacy Byxbee, are expecting their first child together, his rep confirms to Us Weekly. "They haven't been keeping it private really, she's just been working on her business with her family so she hasn't been around," a source tells Us of Byxbee's pregnancy. "She's expecting very soon." In anticipation of their new arrival, Byxbee was the guest of honor at a baby shower last weekend, the source adds to Us. She was joined by family, friends, and her sisters in L.A.
Caan, 37, opened up about his relationship with his girlfriend of "a couple years" during an appearance on Chelsea Lately back in January 2013. "She should get the purple heart because I'm a complete disaster," he said. The couple live together in Hawaii for the star's CBS series, but said the "relaxed" nature and lack of "hustle" isn't ideal. "Everything's very slow-motion. I pick up the cup and they slowly pick of the cup," he joked. "His dad James is really close with him," the insider adds to Us. "He is very excited."